While researching my brake issues, I gave Chris at Centre Gravity a call. I had spoken to Chris before the CAT driver training, and was waiting on the results of the training to see whether the suspension needed further work. Based on the handling pan tests, the suspension setup seems to be ok, but the brakes remain an issue. I have Chris a call to update him, to ask a few questions about brakes and tyres, and to mention the handling tests of the car (Colin from CAT and Chris have worked together in the past). We discussed tyres first. Of the list of tyres I have found which fit the car (see part-way down this page), and based on my criteria of mainly road driving with a bit of track, he rated the T1-Rs and the Continentals. The continentals are good tyres. The T1-Rs have slightly softer rubber (more grip, more wear) and softer sidewalls – perhaps less grip, more progressive breakaway. The light TVR might be well suited to softer side-wall tyres. Since the Continentals can be quite a bit more expensive than the Toyos, the T1-Rs might be what I buy, but we will see what the prices are when I start shopping. Regarding brakes – imbalance of pads seems like the most likely option, followed by caliper issues. The tyres are all equally old, but it makes sense to change them at the same time to reduce the potential culprits. If that doesn’t work, we could look at suspension. The Gaz Gold Pros do not have separately adjustable bump and rebound damping, but one knob which controls both. One approach could be to back all shocks off to fully soft, and then bring them up a couple of clicks at a time testing the handling. An initial thought is that the rear could be set too soft, reducing traction under braking. The harder the rear is set, the more likely the car will become tail happy. It seems like a bit of a dark art to me at the moment, and lots of testing could shred the tyres, so hopefully pads will fix it. We spent some of today in the Tamora at CAT driver training at Millbrook. We had rearranged our performance driving day from earlier this month when snow stopped play, and today we had perfect dry weather. 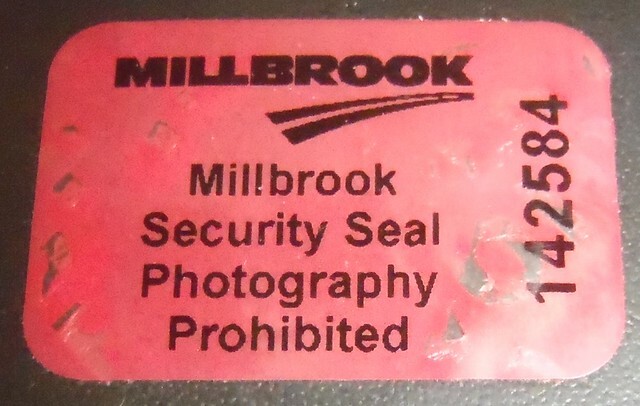 Millbrook is a great place with an impressive variety of facilities. The driver training day uses the mile straight for braking and brake / swerve, the high-speed bowl, the handling circuit, the Alpine route, and a big skid-pan with lots of coloured circles of different diameters to follow. It might use other parts too, but our day ended sooner than we would have liked. As the TVR doesn’t have ABS, we used a Ford Focus to practice some ABS braking / brake & swerve techniques before doing some threshold braking. 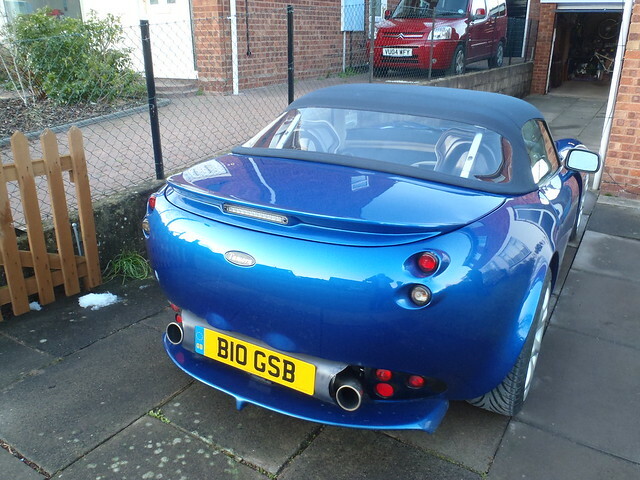 We then swapped to the TVR which, until now, I have always driven fairly steadily and have not locked up the brakes. This is not a stable car setup, and the brake test is a good thing to get done early in the day to check that aspect of the cars handling. Colin discussed whether we wanted to continue with a car that was not handling properly, or postpone the day until we have the car fixed and then carry on from where we left off. This is very good of him, since it effectively writes-off 2 days of his time for our one day of training. Before finishing, we went onto the 40m circle, and in both directions increased speed until the car started to lose traction. 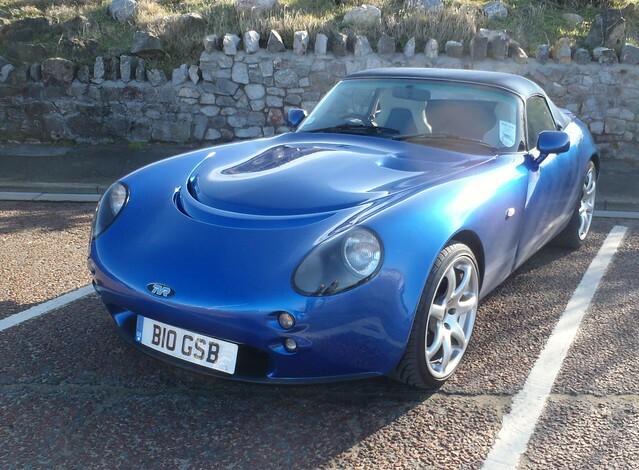 In this respect the TVR is set-up very well (thanks TrackVRoad) – it goes into very mild understeer when pushed, that can turn into slight lift-off oversteer, or can be balanced out with a bit more throttle. On our way back we popped into TVR Power and had a chat with Jason. He noted that the rear pads were EBC Greenstuff, and it wasn’t clear what the fronts were since the back of the pads is not visible. A mismatched set of pads seems the most likely reason for the brake issues, given the calipers all look in good condition, as do the disks and tyres. I now have a to-do list of new pads, new tyres, and new radiator before I return to complete my driver training. Based on what we have done so far, I am really looking forward to returning to Millbrook, and am grateful to CAT for being so helpful. There were lots of interesting development vehicles going round Millbrook. My photo from the day is here. Checking the TVR a day after parking it in the garage, there were a few new drips on the piece of white paper, and a small amount of coolant was visible running down the radiator. When I returned to the car after a week, there had been more drips, so 1/2 the paper was damp, but the coolant level has yet to drop noticably. 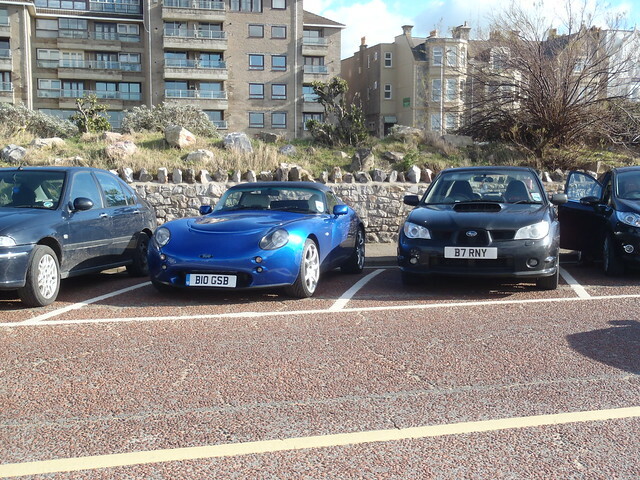 A sunny Sunday, so we headed off to the seaside and took the TVR to Weston-super-Mare. A fair drive, but I had never been there before. On Saturday I had checked the tyre pressures with my new Draper pressure gauge – the hose and presure release button are both very useful. We set off at 08:15, annoyed because once again they had been road gritting. No sign of the temperatures dropping below zero, but they still gritted Luckily this was only for the first 20 miles, then the rest of the 165 mile trip was fine. I drove down, and the car behaved very well. The seafront road had speed bumps, but the TVR, following its nose lift, had no problems, and there were plenty of parking spaces at 10am on a Sunday. Weston seems like a pleasant place, following a good walk road, some breakfast, and then some fish and chips later, we headed back home. The locals / tourists had the good taste to look at the noisy TVR as it burbled slowly along. The drive back was fine. On the M5 I swapped with Naomi and she drove. We stopped in the only service station I have come across that has a lot of speed bumps. It might have been Michael Wood on the Northbound M5. On returning home we had a bit of a garage sort, as my Robot Wars robot (photos) is being donated to a school next week. This makes more space for bikes / car. 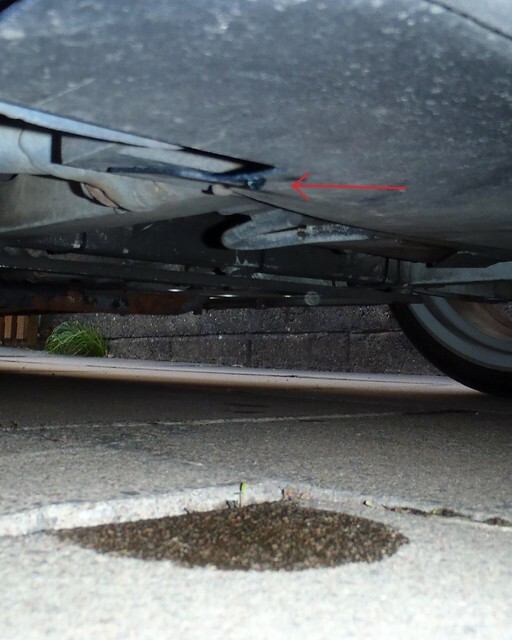 I noticed a few drips under the car. 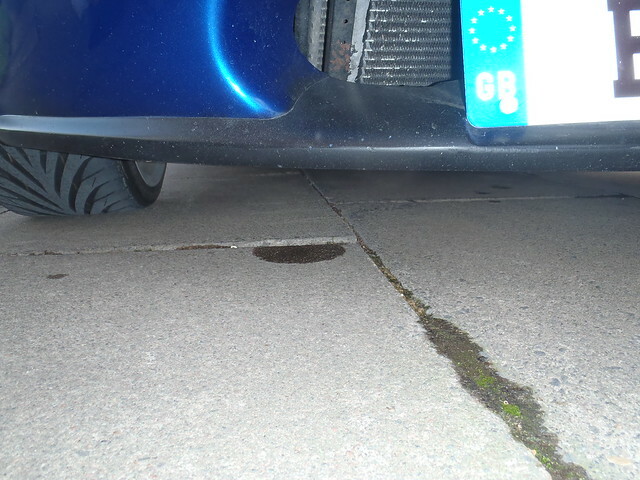 They felt more like coolant than oil, and the location coincides with a corner of the radiator. I shall have to investigate further and keep an eye on coolant levels. Having bought an immaculately clean car from TrackVRoad, we had clocked up 1000 winter miles without washing the car. I don’t use car washes (a bad idea on a TVR anyway), and finding a nice day to wash the car, dry the car, and then take it for a good drive on dry roads, not covered in salt, to get rid of any remaining water before putting it back in the garage is tricky. But today was a good day. We had already been out in the Mondeo in the early afternoon and the roads were dry and clean. 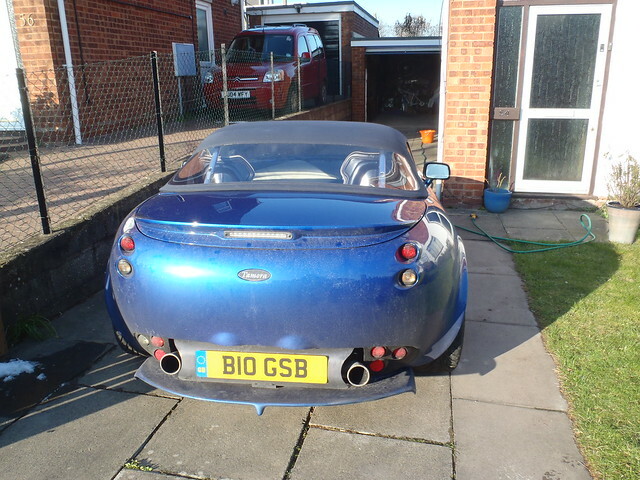 When we got back, we rolled the TVR out of the garage and gave it a good wash. The temperature was 0 C. Everything is trickier at this temperature. The extension lead that had been running the trickle charger was just that bit less flexible which made rolling the cable awkward. Same for the hosepipe. I used my new car Autoglym shampoo, new microfibre wash mitt for the bodywork, new sponge for the wheels, and new Autoglym microfibre towel to dry the car. I would normally use a chamois for drying, but decided to give this a go. At first it was great, but when it became saturated it was harder to use than a chamois. I think the best plan is to get a chamois for 90% of the drying, and then go over the car with the microfibre cloth to finish off. The car didn’t take long to clean, I am used to cleaning much larger cars. The wheels are fiddly though. On a nicer day I will take them off or spend more time, but given the cold conditions and the fact I wanted to finish quickly and start driving I didn’t clean the inner surface of the wheels. 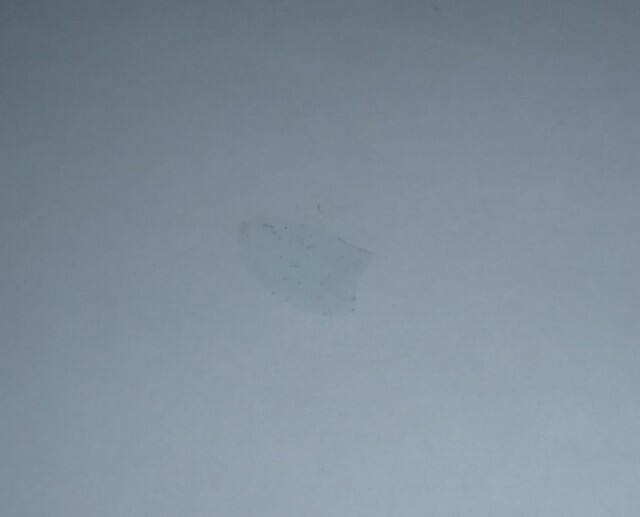 I sprayed the underside as best I could to get rid of any salt that may have stuck there. I also opened the doors / boot and gave the exposed areas a clean. No water seemed to have made its way inside, but the rear screen was a little misty for the first part of the drive. When we started off, there was a display warning for an oil temp of 0 C which I had to cancel. Earlier in the day I had gone into the display computer and customised a display so that I had a large Speed (mph) on the left and equally large oil temp on the right. This is the display I will use for warming up from now on. On the left it also shows water temp, oil pressure, and litres of fuel remaining (I think) in small text. The car started fine, took an extra second of turning over compared to normal. 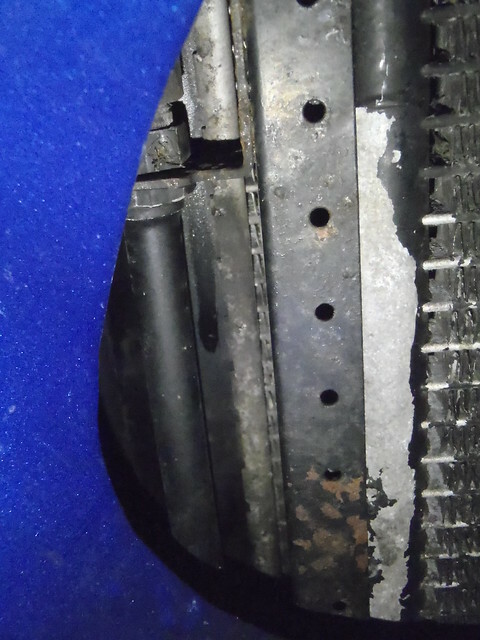 When it caught it ran fine, and soon steam appeared as the water on the exhaust manifolds evaporated. We went on a fun 40 minute A-road drive and the car behaved well. Water temps went up to 70 C, and oil slowly made its way to 60 and then stayed in the 60 – 65 C range. Back home, the car was tucked up in the garage, and may stay there until the rearranged drivers day unless we have some more nice weekend weather. We were both really looking forward to it, but after a very mild winter in which we have done 1000 miles in the TVR, it has finally turned cold and snowy. We returned home at 16:15 following a trip to the very quiet shops in our Mondeo which is running proper winter tyres, Dunlop Wintersport 3D. See here for their use in France last winter. The main roads through town are now covered. 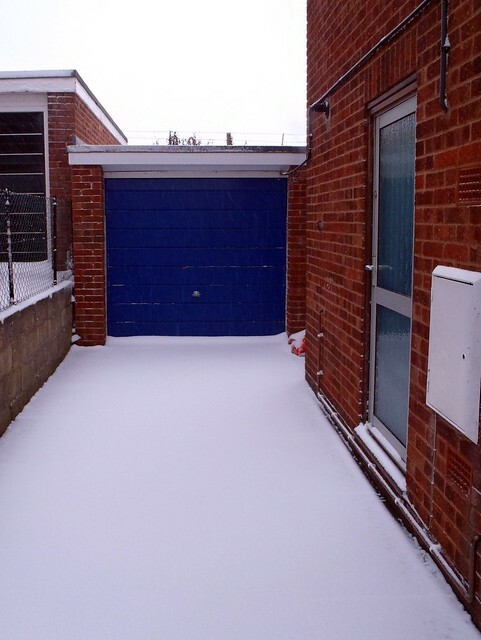 It isn’t a lot of snow, but because it is cold it has settled. Conditions are quite slippery, even with winter tyres. The TVR on its summer tyres would be dangerous. Maybe it will all be gone in the morning, but it seems unlikely, and the snow is due to fall through the night to the east where the training is held (Millbrook). Jo and Colin have been very good about being flexible with the date, and had been happy to leave it to today to decide what we would do. Hopefully the weather will be ok later in the month and we can do the training, which we are both really looking forward to. For now, the TVR stays tucked up safely in its garage.